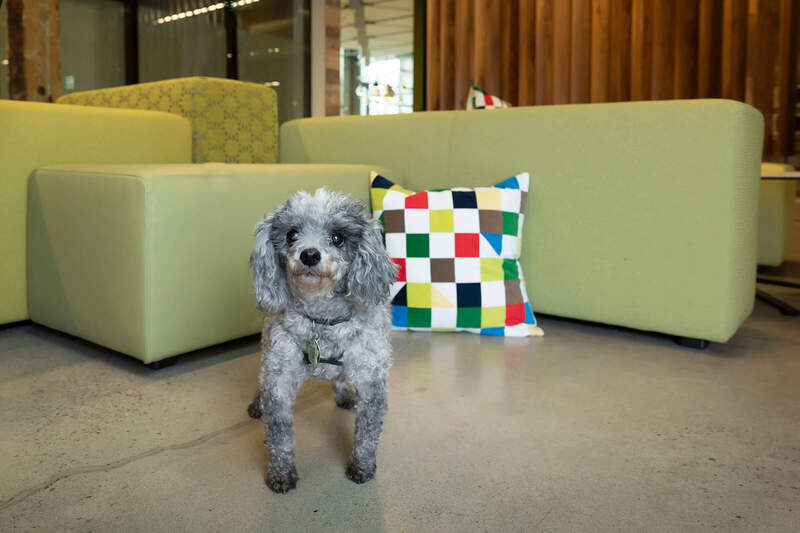 I think you would be hard pressed to find a more dog-friendly workplace than the one the folks at Softchoice enjoy. 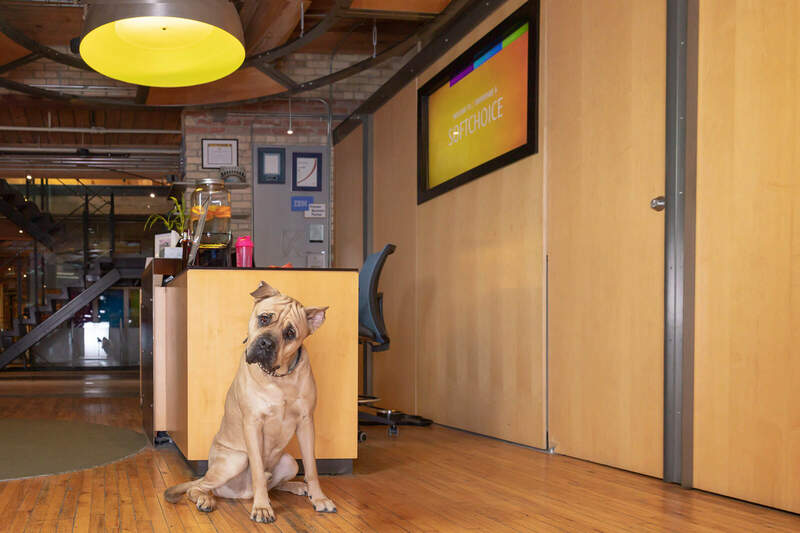 That much is apparent when you first step inside their Liberty Village offices and are greeted by Clyde (pictured below), an impressive presa canario who is, in my estimation, one of the best ‘receptionists’ you will ever have the pleasure to meet. 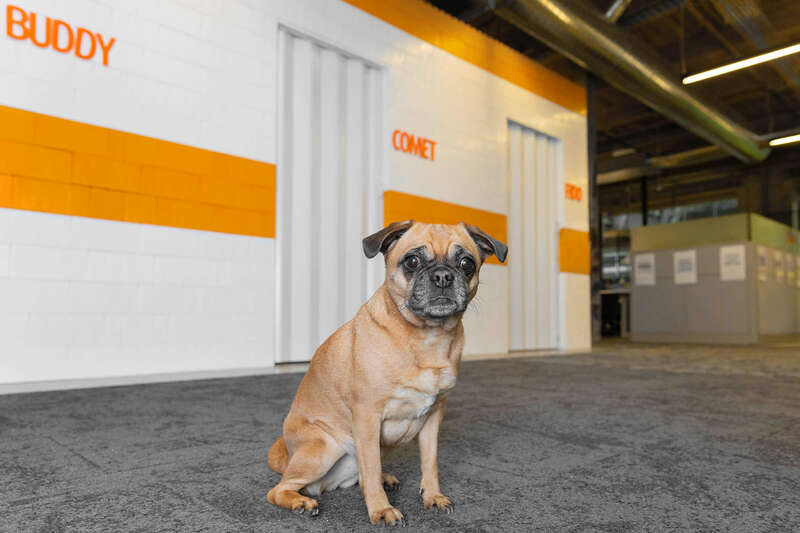 And in case you thought that perhaps there was a mistake, there is a sign on the desk that introduces you to Clyde and assures you that yes, he is meant to be here. 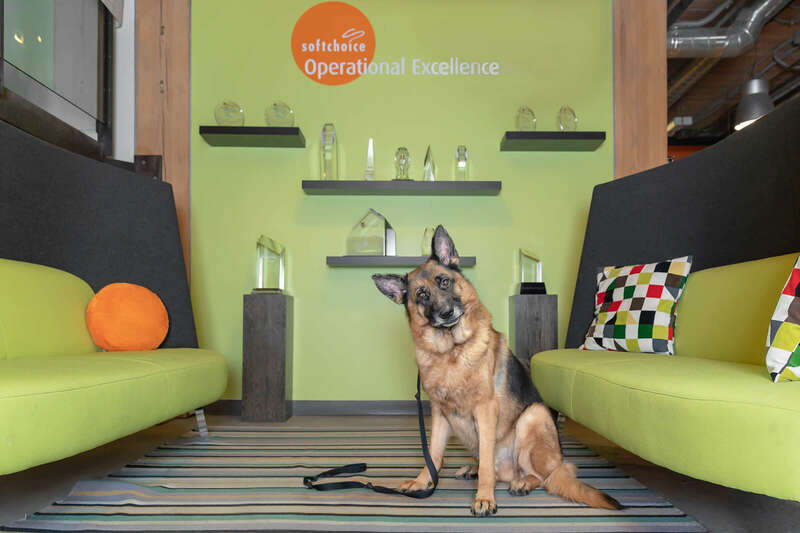 It is not really all that surprising when you get to know a little about Softchoice and their take on dog@work. There are currently over 100 dogs in the D.O.G. program at softchoice, spread out over their 2 buildings located in the Liberty Village hub. As anyone can tell you, that is a lot of dogs! Dogs who interact with each other and the humans around them on a daily basis. There is a hardworking committee of 6 who oversee the program. There are some basic principles: an application and approval process; everyone should feel comfortable at work, zero tolerance when it comes to bites. These sound great on paper, but how to navigate the pitfalls of fear, allergies, washroom accidents and conflict? 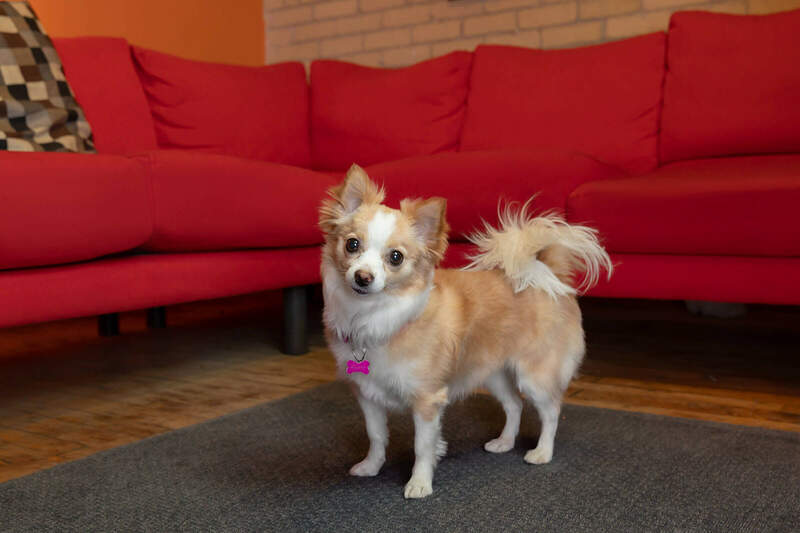 Q – What are the requirements to bring your dog into the office? Not everyone can just bring their dog into work with them. First to be considered is the human. Every employee must be in-role for at least 3 months before they can apply and must have their manager’s approval. Then, comes the pup. 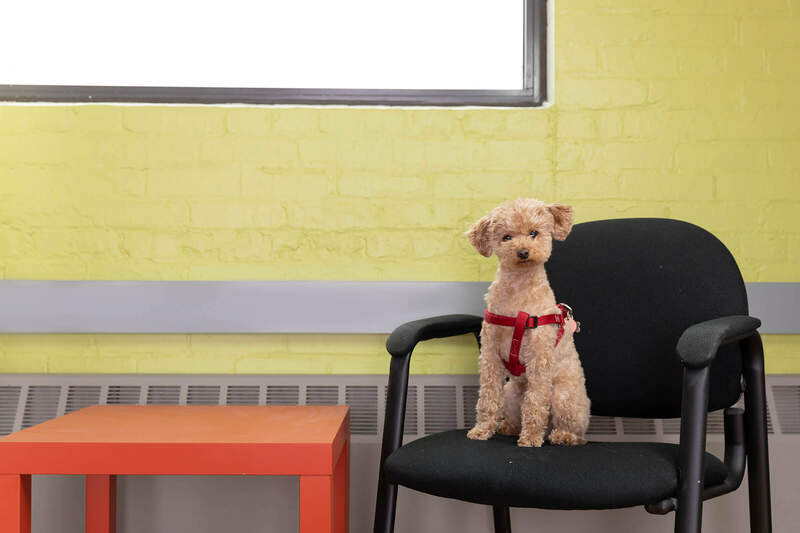 All dogs must be potty-trained, vaccinated (the core 4), and females in heat cannot come into the office. 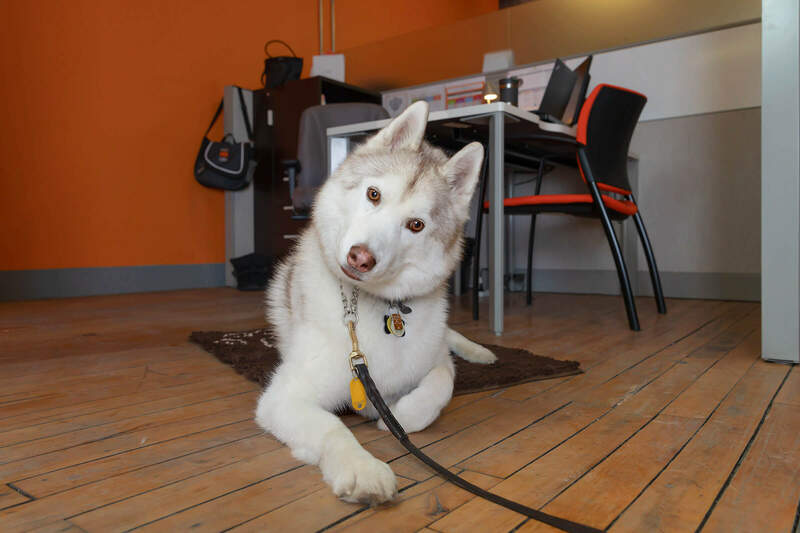 All potential canine workmates are brought into the office to meet other people and other dogs and assessed on how they behave. If this goes well, dogs are approved. Q – What about employees who have allergies or a fear of dogs? Dog-free zones are established within Softchoice and are strictly enforced. 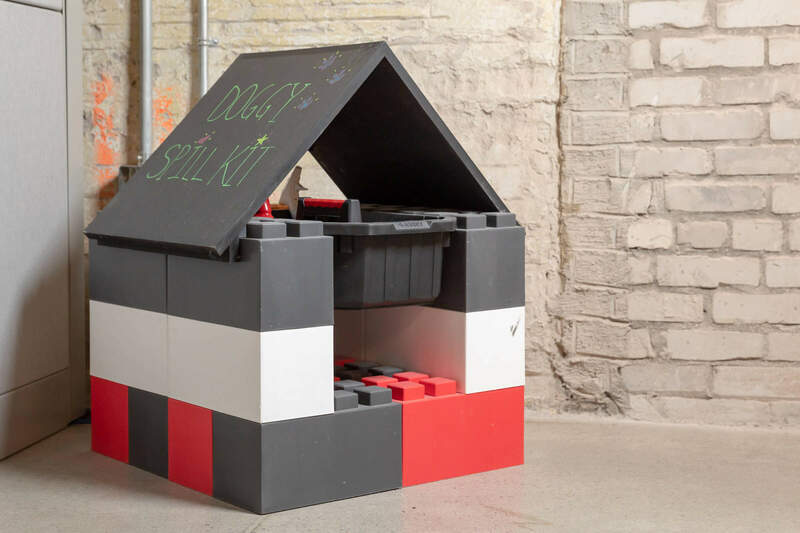 Essentially anywhere with a sink (kitchen, lunchroom, gym, bathrooms) is dog-free. 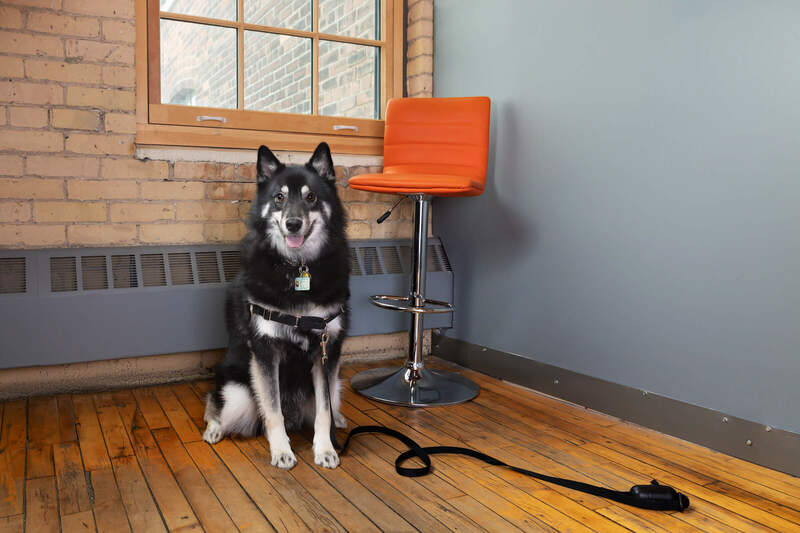 There are also dog-free working areas for those who find it uncomfortable or who are fearful of working with dogs. 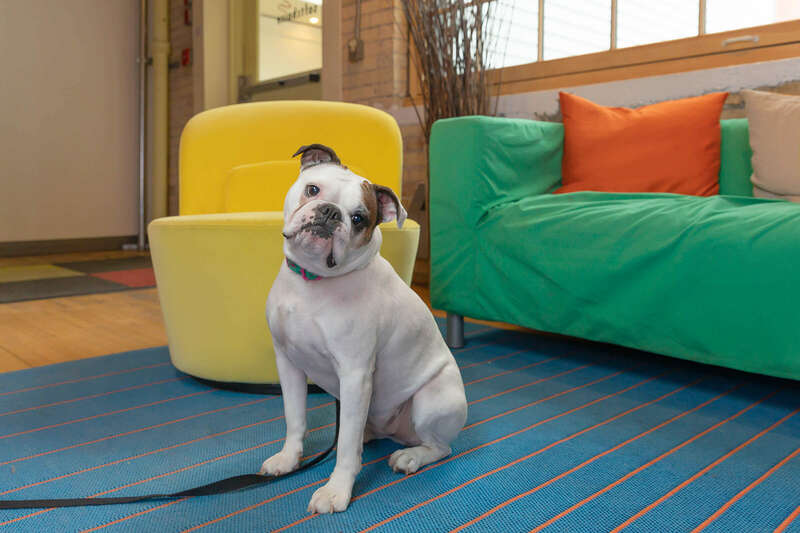 For those with allergies, some dog-free areas have separate air duct systems and an employee can request to sit there. 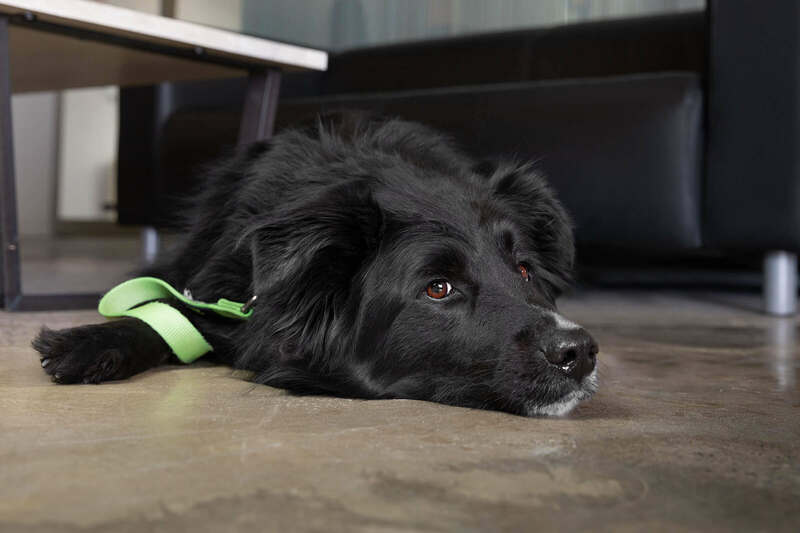 Even within areas where dogs are allowed, all dogs must be on leash and connected to something (a desk leg) or someone at all times. They must also be supervised at all times by either the owner or a designated sitter. There is no allowance for inappropriate interactions. Q – There must be, ahem, ‘accidents’…? 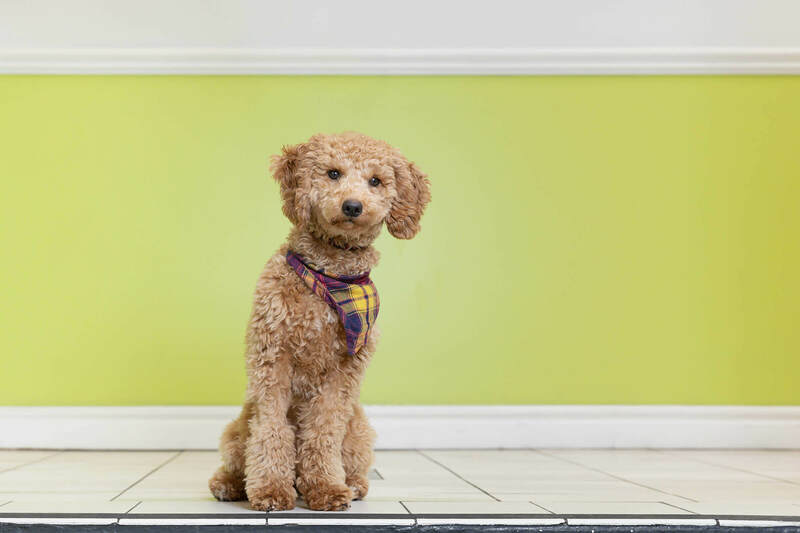 While every pup is potty-trained, accidents can and do occur. It is clearly the responsibility of the owner to clean up. There are clean-up kits (see below) distributed within the offices and 1 bathroom outside designated for this purpose. Q – What about conflicts? Softchoice has zero tolerance for biting. Any incident will be investigated and if a bite has occurred, the pup is immediately suspended for 6-12 months. After the time period has elapsed, the owner can request a reassessment, but it will only be considered if rehabilitation or training has taken place during that time. 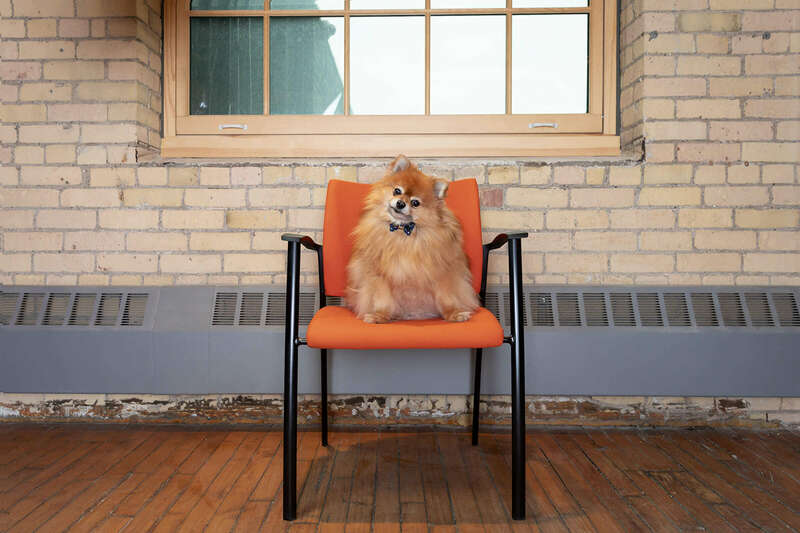 And any dog allowed to reenter the workplace will be on a probationary basis. 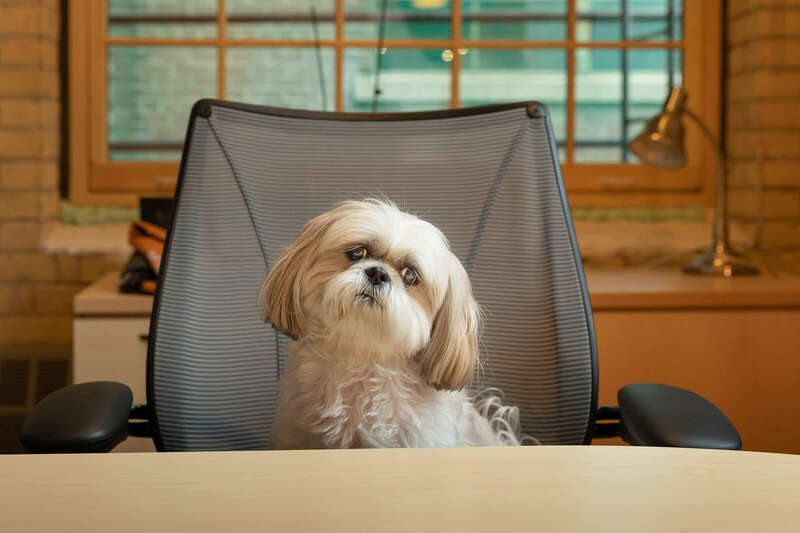 The employee complaint system is anonymous and follows a “3 strikes” system for employees found to not be following the rules: a dog not on leash, found in a dog-free zone, or being disruptive to fellow coworkers. 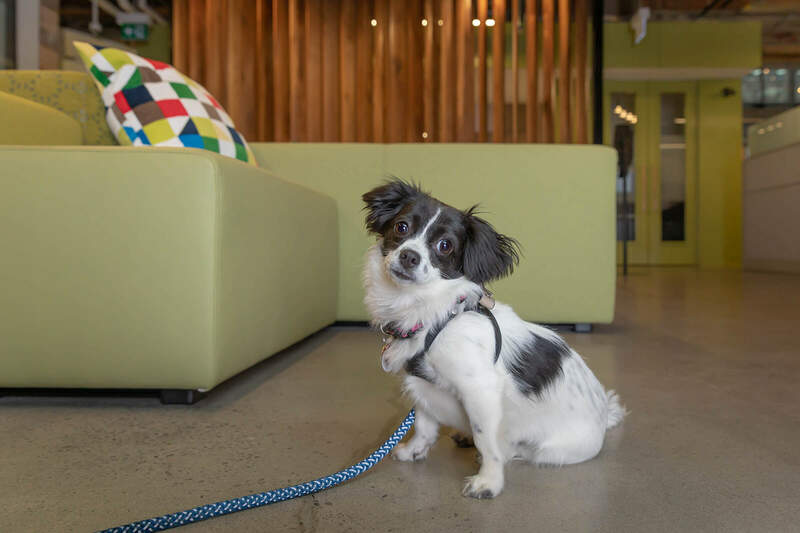 Bringing a dog into the workplace is a privilege and employees who cherish it follow the rules. Sounds great…now, can we meet some pups? Everyone of the 17 dogs we met and photographed during our visit was a darling. 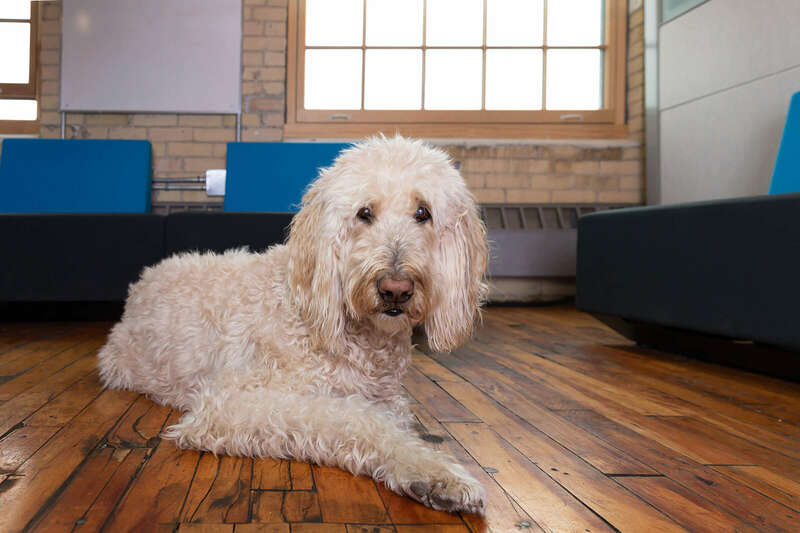 As you will quickly see, Softchoice boasts a pretty awesome interior full of coloured walls, exposed brick, collaboration spaces, nooks and cranies for all…including all those dogs! Huge thanks to (in order) Molly, Murphy, Rosie, Gertie, Madison, Murphy, Clyde, Lola, Chili, Ducky, Sushi, Kaiser, Rosa, Q, Myla, Moose, and Kai. And of course the team of PEOPLE at Softchoice who coordinated it all! 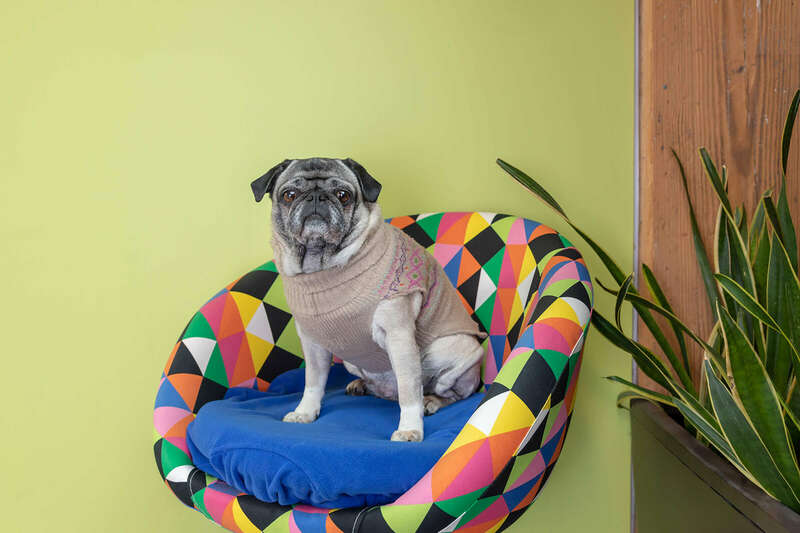 Would you like us to come to your offices and photograph your corporate canines or first-rate felines? 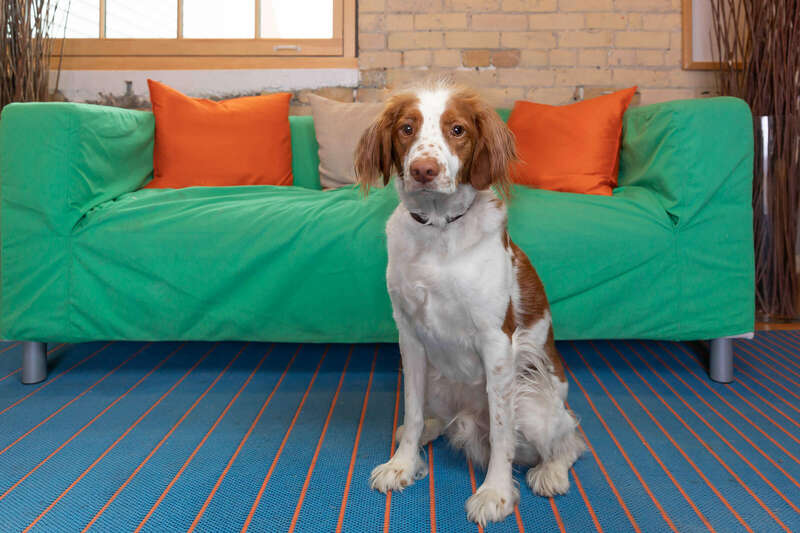 Contact us to see how you can bring Dog @ Work to your workplace.